The retail industry is one of the most competitive and saturated markets in the UK. Numerous challenges that exist in the macro and micro environment pose a serious threat to retailers’ competitiveness and survival (Morden, 2016). The aim of this report is to critically analyse the internal and external business environment of Tesco, a British multinational groceries and general merchandise retailer (Tesco, 218a). For this purpose, a range of strategic management and marketing instruments, such as PESTLE, SWOT, Porter’s five forces and value chain have been utilised. Based on the produced findings, practical recommendations as how Tesco could add to its competitiveness in the retail market are formulated. Tesco was established in 1919 by Jack Cohen as a small grocery store. Today, Tesco is a multinational corporation that operates in such countries as India, Thailand, Slovakia, Malaysia, the Czech Republic, Poland, and Ireland (Tesco, 2018a). In addition to food and non-food products, Tesco provides telecommunications and financial services (Tesco, 2018f). In total, the company runs over 6,800 stores and has more than 440,000 employees all around the globe (Tesco, 2018b). In turn, with more than 3,400 stores and 300,000 employees, Tesco is the largest grocery and general merchandise retailer in the United Kingdom in terms of market share (Tesco, 2018c). In the 2017/2018 financial year, Tesco generated £51 billion in sales, a 2.5% increase compared to previous year and £1,644 million in operating profit, which is a 3% increase compared with its 2016/2017 report (Tesco, 2018d; Tesco, 2018e). Nevertheless, as demonstrated by the chart above, Tesco’s market share in the UK is declining, which can pose a threat to its competitiveness in the future. Brexit is one of the most important political factors that can influence Tesco’s competitive position in the British retail market (Potts, 2018). As a large multinational company, Tesco supplies food and non-food products not only from British suppliers, but also from abroad (Tesco, 218e). However, the UK’s withdrawal from the EU has increased fresh food import duties, which in turn, have put additional pressure on Tesco’s profit margins (Morden, 2016). At the same time, the UK is a stable country from the political perspective, which translates into a low level of corruption and bureaucracy (Transparency International, 2018). The fact that the UK is an economically stable country creates a favourable business climate for companies such as Tesco. In 2009, the government reduced the interest rate from 5% to 0.5%, which is observed as follows (Trading Economics, 2018b). As a result of this action, consumers’ purchasing power has increased as the level of unemployment has reduced from 8.5% in 2012 to around 4% in 2018 (Trading Economics, 2018a). However, Brexit is expected to result in a drop in consumption from Brits, which would negatively affect Tesco’s financial performance (Martin, 2017). Health-consciousness is one of the key social trends that can impact Tesco’s competitiveness in the UK retail market (Chernev, 2018). Sales of organic food and drinks in the country were reported to increase by almost 6% in 2017 and amounted to £2.2 billion (Smithers, 2018). In turn, Tesco saw organic sales rise by 15% in 2017, the strongest sales for over a decade (Tesco, 2017). By contrast, the population in the UK is getting older, which is an important social factor that should be considered by Tesco as older people tend to purchase fewer food products in stores (ONS, 2017). Technology is the key environmental factor in this category that can have a direct impact on Tesco’s competitiveness in the UK retail market. The company has already implemented a range of technological advancements, such as radio-frequency identification, digital marketing, and analytics (Morden, 2016). Tesco is well-presented in the social media environment with 2.5 million followers on Facebook and 540,000 followers on Twitter (Facebook, 2018; Twitter, 2018). Nonetheless, Tesco should further implement technology (e.g. artificial intelligence (AI) and augmented reality) in its supply and value chains to keep its customers a top priority (Chernev, 2018). Although Tesco runs around 3,400 stores in the UK, it has been steadily increasing its online grocery capacity. This has been achieved through the collection and analysis of information regarding consumers’ purchase behaviour, preferences, and wants (Tesco, 2018e). However, mounting concern about personal data usage has resulted in the implementation of the General Data Protection Regulation (GDPR) (GDPR, 2018). This regulation significantly limits Tesco’s ability to collect, store, and process its customers’ personal data. In 2011, the standard rate of value-added tax (VAT) increased from 17.5% to 20% (Government, 2018). Given that many of Tesco’s products include this tax, it has to increase the price for its goods to cover the cost of VAT. Since 2015, Tesco has reduced its absolute carbon emissions by 26%, making it more environmentally sustainable (Tesco, 2018g). In 2017, the company switched to 100% renewable electricity in the UK. Tesco is planning to ‘extrapolate’ this practice to all its stores all around the globe by 2030 (Johnston, 2018). Nevertheless, tightening environmental regulations and policies could have a negative impact on Tesco’s competitive position in the UK. Tesco is one of the largest retailers in the UK in terms of both market share and revenue, making its brand highly recognisable and recallable among British consumers. According to the recent market research conducted by Deloitte (2018), Tesco was ranked as the 11th largest retailer in the world in terms of retail revenue and net income. This high rank is partly explained by Tesco’s strong financial performance over the last few years, which can be observed as follows. In 2018, Tesco’s like-for-like sales in the UK increased by 2.3% due to its strong performance in the fresh food department (Tesco, 2018e). However, as previously reported, Tesco has been losing its market share in the United Kingdom. The main reasons for this decline include the lack of flexibility, product quality issues, and competitors’ aggressive market acquisition strategy (Davey, 2018; Moore, 2018). There are considerable business opportunities for new strategic alliances with other organisations and brands to make Tesco’s product range more diversified and attractive to a greater number of consumers. Tesco has reported its strongest growth in the UK in five years, which is predominantly explained by its takeover of Booker, a UK-based wholesale provider (Tesco, 2018e). In addition, Tesco has attempted to tackle the rising threat by Lidl and Aldi by launching its own discount chain named Jack’s (Jordan, 2018). This diversification is expected to help Tesco become more competitive in the UK, while minimising its exposure to the risk of financial loses. Nonetheless, other large retailers such as Sainsbury’s Morrisons have also been demonstrating a steady growth in performance. Given Tesco’s highly complex supply chain as well as low switching costs for consumers, its competitors could offer lower prices and more efficient customer service. The competitiveness of Tesco’s business environment was examined with the help of Porter’s five forces model. The analysis findings are summarised as follows. The UK retail market is very competitive since there are numerous organisations (e.g. Aldi, Lidl, Morrisons, and Sainsbury’s) that operate in this segment. The major rivals compete over products, prices, and promotions, making the level of their similarity quite high (Chernev, 2018). The bargaining power of customers is also relatively high as the switching costs in the retail industry are low. Hence, consumers can easily switch to another retailer if they are not happy with Tesco’s product range, customer service, or pricing policy. Nonetheless, Tesco serves more than 80 million customers on a weekly basis (Tesco, 2018d). This fact slightly reduces customers’ bargaining power. The bargaining power of suppliers is rather low since Tesco supplies food and non-food items from more than 1,000 suppliers all around the globe (Tesco, 2018e). Thus, Tesco can easily negotiate product prices, while selecting only those supplies that offer products of the highest quality. The threat of substitution in the retail industry is medium. On the one hand, the major substitutes of large retail chains are small convenience stores and organic shops that do not pose any serious threat to Tesco’s financial sustainability. In addition, due to the economies of scale effect, Tesco can offer the same goods at a cheaper price, making them more attractive to consumers (Tesco, 2018e). On the other hand, consumers can purchase non-food products (e.g. apparel) from other well-known retailers such as Zara, H&M, or Gap. The threat of new entrants is low since companies have to invest considerable financial resources to establish their presence in the retail market. A high level of market saturation is another factor that prevents enterprises from entering this market segment (Smithers, 2018). Tesco’s primary activities are analysed in this report since they are directly concerned with the delivery of its products and value creation (West et al., 2015). Tesco puts an emphasis on its agile and lean inbound logistics function. As previously noted, Tesco’s bargaining power is high, allowing it to supply goods and raw materials at low prices. A network of owned distribution warehouses has also significantly added to the effectiveness of its stock management (Tesco, 2018e). In terms of outbound logistics, Tesco has developed a distribution and delivery system, which allows for serving both online and offline customers with the same level of effectiveness (Chernev, 2018). Finally, the retailer’s approach to the location of its stores has allowed for targeting specific groups of consumers and attaining a higher level of customer exposure (West et al., 2015). 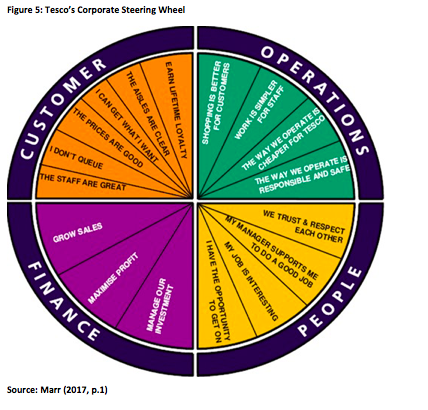 The Corporate Steering Wheel is a strategic business performance framework designed by Tesco. By using this framework, Tesco can monitor and manage specific dimensions of its operations. The effectiveness of Tesco’s strategic management can be evaluated looking at the dynamic capabilities of the company, specifically its management’s capability to adapt its performance evaluation framework in accordance with a volatile, uncertain, complex and ambiguous (VUCA) environment. 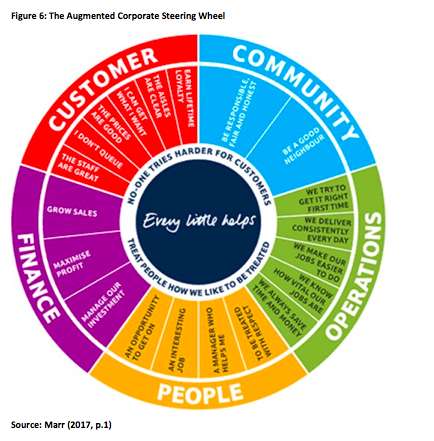 Figure 6 shows the augmented version of the Corporate Steering Wheel developed in response to the VUCA environment (Marr, 2017). Environmental and other factors trigger the need for addressing the community perspective. Tesco has acknowledged its influence on the environment and local community, as well as the community’s interest in this influence (Marr, 2017). As a result, the community dimension was added to the framework, putting more strategic emphasis on the matter company-wide. The practical final physical output of this change was, for example, a greater use of locally sourced products, a 50% reduction of the use of carrier bags and a decrease in the carbon dioxide footprint (Marr, 2017). It has to be noted, that the timeframe for the response has to be taken into account, and it can be argued that it takes too long for Tesco’s management to respond to changing environment (e.g. animal welfare trend) (Murphy, 2017). Additional performance management efforts involve the semi-annual company-wide survey and review (Our Tesco, 2018). Each employee is given a chance to complete an anonymous survey regarding Tesco’s operations and to provide feedback and general suggestions. These are then used to highlight the problems within the corporate structure, which are then addressed accordingly by the management. The entire process is outsourced in order to resolve possible conflicts of interest; however, this implies the loss of control over the process and possibly increased costs (Our Tesco, 2018). Tesco is well-known for its loyalty schemes and programmes that provide its customers with a range of bonuses (e.g. deals, discounts, and vouchers), making them more loyal to the Tesco brand (Tesco, 2018e). However, privacy concerns and the implementation of the GDPR can force Tesco to limit the use of its customers’ personal data (e.g. the store they shopped in, product bought, and price paid) for marketing purposes (GDPR, 2018). Tesco gives close attention to the quality of customer service by ensuring that its employees can fully address its customers’ needs. For instance, the company has developed a range of training programmes that help its workers acquire the knowledge in digital competence, food and product safety, health awareness, and other legal, financial, and regulatory developments (Tesco, 2018e). While Tesco still remains one of the leading food and general merchandise retailers in the UK, the external environment analysis has indicated that the business world is changing at a rapid pace (Moore, 2018). To cope with this change and remain competitive, it is recommended that Tesco should further invest in technological advancements such as AI and augmented reality. For instance, Tesco could use machine learning to provide consumers with relevant recommendations on presents for their family members and friends. It is also recommended that Tesco should establish strategic partnerships with other retail organisations such as Booker in order to further diversify its product range and brand portfolio and strengthen its competitive position in the UK retail market. Chernev, A. (2018) Strategic Marketing Management, Chicago: Cerebellum Press. Davey, J. (2018) “Aldi pursues UK expansion after record Christmas”, [online] Available at: https://uk.reuters.com/article/uk-aldi-uk-outlook/aldi-pursues-uk-expansion-after-record-christmas-idUKKBN1ET0NB [Accessed on 23 November 2018]. 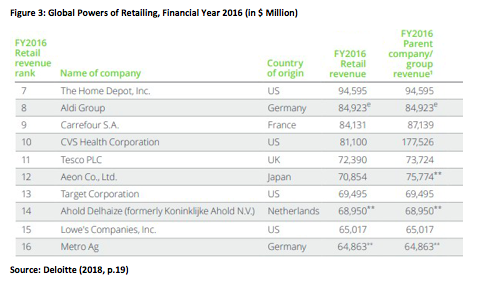 Deloitte (2018) “Global Powers of Retailing 2018”, [online] Available at: https://www2.deloitte.com/content/dam/Deloitte/at/Documents/about-deloitte/global-powers-of-retailing-2018.pdf [Accessed on 23 November 2018]. Facebook (2018) “Tesco”, [online] Available at: https://www.facebook.com/tesco/ [Accessed on 23 November 2018]. GDPR (2018) “The official website”, [online] Available at: https://eugdpr.org/ [Accessed on 23 November 2018]. Government (2018) “VAT rates”, [online] Available at: https://www.gov.uk/vat-rates [Accessed on 23 November 2018]. Johnston, I. (2018) “Tesco to switch to 100% renewable electricity this year in UK and by 2030 worldwide”, [online] Available at: https://www.independent.co.uk/environment/tesco-switch-renewable-lectricity-energy-uk-2017-by-2030-worldwide-supermarket-a7739076.html [Accessed on 23 November 2018]. Jordan, D. (2018) “Tesco’s new discount chain Jack’s takes on Aldi and Lidl”, [online] Available at: https://www.bbc.com/news/business-45572731 [Accessed on 23 November 2018]. Marr, B. (2017) “Tesco: Evolving the Strategic Performance Framework”, [online] Available at: https://www.bernardmarr.com/default.asp?contentID=1123 [Accessed on 23 November 2018]. Martin, W. (2017) “Brexit has sent Britain’s consumers down a slow, painful road away from prosperity”, [online] Available at: http://uk.businessinsider.com/brexit-uk-consumer-economic-impact-2017-9 [Accessed on 23 November 2018]. Moore, J. (2018) “Brexit handing the high street to Germany’s Lidl as Sainsbury’s is put in the shade”, [online] Available at: https://www.independent.co.uk/news/business/comment/brexit-handing-the-high-street-to-germanys-lidl-as-sainsburys-is-put-in-the-shade-a8151141.html [Accessed on 23 November 2018]. Morden, T. (2016) Principles of Strategic Management, London: Routledge. Murphy, R (2017) “Animal welfare campaigners protest outside Tesco Express, Thetford”, [online] Available at: http://www.edp24.co.uk/news/animal-welfare-campaigners-to-protest-outside-tesco-express-thetford-1-5145905 [Accessed on 23 November 2018]. ONS (2017) “Overview of the UK population: July 2017”, [online] Available at: https://www.ons.gov.uk/peoplepopulationandcommunity/populationandmigration/populationestimates/articles/overviewoftheukpopulation/july2017 [Accessed on 23 November 2018]. Our Tesco (2018) “How We Communicate Together”, [online] Available at: https://www.ourtesco.com/how-we-communicate-together/ [Accessed on 23 November 2018]. Potts, O. (2018) “Tesco’s new Brexit supermarket doesn’t stack up”, [online] Available at: https://www.spectator.co.uk/2018/09/tescos-new-brexit-supermarket-doesnt-stack-up/ [Accessed on 23 November 2018]. Smithers, R. (2018) “Supermarket sales of organic food and drink continue to rise”, [online] Available at: https://www.theguardian.com/environment/2018/sep/04/supermarket-sales-of-organic-food-and-drink-continue-to-rise [Accessed on 23 November 2018]. 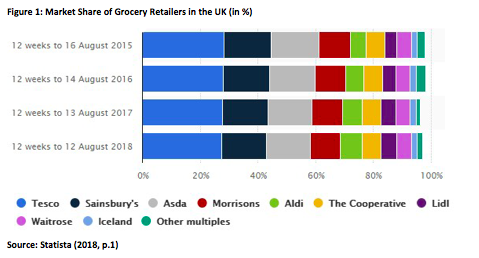 Statista (2018) “Market share of grocery stores in Great Britain from August 2012 to August 2018”, [online] Available at: https://www.statista.com/statistics/300656/grocery-market-share-in-great-britain-year-on-year-comparison/ [Accessed on 23 November 2018]. Tesco (2017) “Organic food sales strongest for over a decade”, [online] Available at: https://www.tescoplc.com/news/news-releases/2017/tesco-organic-food-growth/ [Accessed on 23 November 2018]. Tesco (2018a) “About us”, [online] Available at: https://www.tescoplc.com/about-us/ [Accessed on 23 November 2018]. Tesco (2018b) “Our businesses”, [online] Available at: https://www.tescoplc.com/about-us/our-businesses/ [Accessed on 23 November 2018]. Tesco (2018c) “Tesco UK”, [online] Available at: https://www.tescoplc.com/about-us/our-businesses/tesco-uk/tesco-in-the-uk/ [Accessed on 23 November 2018]. 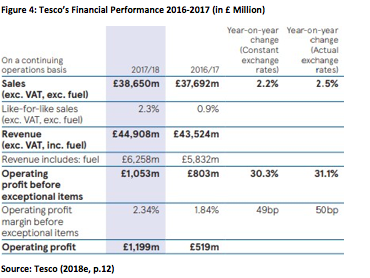 Tesco (2018d) “Key facts”, [online] Available at: https://www.tescoplc.com/about-us/key-facts/ [Accessed on 23 November 2018]. Tesco (2018e) “Tesco annual report 2018”, [online] Available at: https://www.tescoplc.com/media/474793/tesco_ar_2018.pdf [Accessed on 23 November 2018]. Tesco (2018f) “The official website”, [online] Available at: https://www.tesco.com [Accessed on 23 November 2018]. Tesco (2018g) “Our carbon footprint”, [online] Available at: https://sustainability.tescoplc.com/sustainability/foundations/topics/carbon-footprint/ [Accessed on 23 November 2018]. Trading Economics (2018a) “United Kingdom Unemployment Rate”, [online] Available at: https://tradingeconomics.com/united-kingdom/unemployment-rate [Accessed on 23 November 2018]. 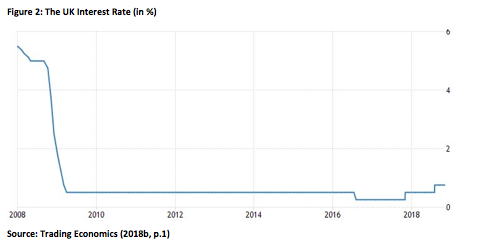 Trading Economics (2018b) “United Kingdom Interest Rate”, [online] Available at: https://tradingeconomics.com/united-kingdom/interest-rate [Accessed on 23 November 2018]. Transparency International (2018) “Corruption perceptions index 2017”, [online] Available at: https://www.transparency.org/news/feature/corruption_perceptions_index_2017 [Accessed on 23 November 2018]. Twitter (2018) “Tesco”, [online] Available at: https://twitter.com/Tesco?ref_src=twsrc%5Egoogle%7Ctwcamp%5Eserp%7Ctwgr%5Eauthor [Accessed on 23 November 2018]. West, D., Ford, J. and Ibrahim, E. (2015) Strategic Marketing: Creating Competitive Advantage, Oxford: Oxford University Press.